We got the opportunity to see the Droid 4 in person and we’re ready to share our initial impressions. Let’s start with the new Droid. 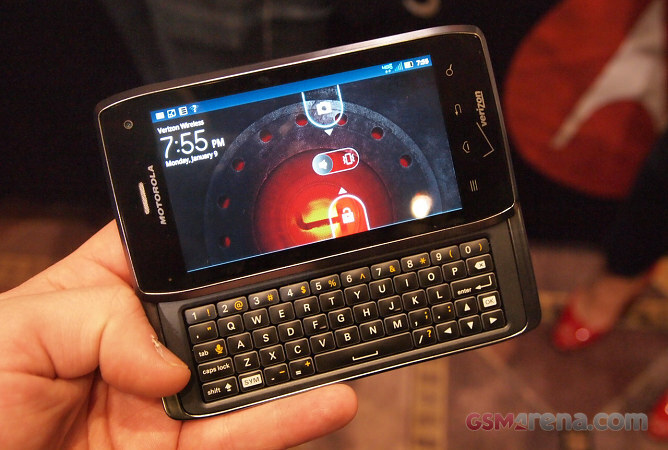 The Motorola Droid 4 measures 126.7 x 69.9 x 12.9 mm and weighs 179 grams. If you’ve just handled the Motorola RAZR (like we did) it feels a little chunky, but it’s fairly compact for its class. It’s heavier than the Droid 3 though (167g) and while it’s not the heaviest phone, we were hoping it would be lighter. The Droid 4 packs a really fancy slide-out QWERTY keyboard – the edge-lit, laser-cut keys provide a very good typing experience and the backlight is very even. The LCD screen on the Droid 4 measures 4″ in diagonal and boasts a qHD resolution. The display is protected by scratch-resistant glass. We’d really like to get a better chance to examine the screen to make sure it doesn’t use a PenTile matrix as Moto has used before on its 4″ qHD screens. Anyway, sliding the screen and keyboard apart isn’t the most comfortable experience as there’s no spring-assistance mechanism to smooth things out. The back of the Motorola Droid 4 felt rather ordinary but that’s probably because we got spoiled with the Kevlar-coated back of the RAZR. Inside is a 1785mAh battery that is good for 12 hours and a half of continuous talk time and about 8 and a half days of standby. Motorola have added a couple of protective layers on the Droid 4 – a hardware one (special water-repellant coating) and a software one, called Business Ready. Business Ready offers government-grade encryption for your contacts, emails and calendar. Verizon is touting 5-12Mbps downlink and 2-5Mbps uplink speeds through their LTE network when using the Motorola Droid 4, but we didn’t get a chance to test that. The Droid 4 will be launching soon but there’s no pricing yet. It will use Android 2.3.5 at launch, but the Android 4.0 Ice Cream Sandwich update is on the way.